After Tahir's career-best 4/27 restricted KKR to 161 for 8, CSK coasted to the target in as Raina anchored the chase with an unbeaten 58 off 42 balls. Imran Tahir spun a web before Suresh Raina found his mojo back with a half-century as Chennai Super Kings inched closer towards another playoff qualification with a five-wicket victory over Kolkata Knight Riders in an IPL match on Sunday. 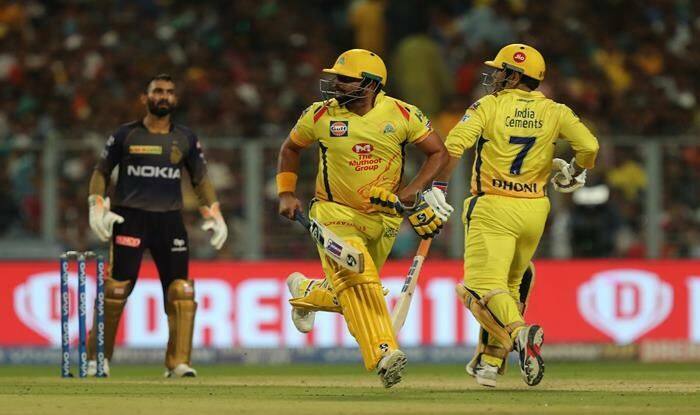 After Tahir’s career-best 4/27 restricted KKR to 161 for 8, CSK coasted to the target in 19.4 overs as Raina anchored the chase with an unbeaten 58 off 42 balls with seven fours and a six. KKR next face Royal Challengers Bangalore on April 19. Sunil Narine was the pick of KKR bowling with figures 2/19 that included a wicket-maiden when he cleaned up Faf du Plessis (24) to end the powerplay. Tahir removed an ominous-looking Chris Lynn (82 off 51 balls; 7×4, 6×6) and in a space of four balls removed the dangerous Andre Russell (10) for the first time under a score of 40 this season to put brakes on their scoring. Tahir’s bowling had such devastating effect that KKR managed just 28 runs from last five overs and went on to lose three more wickets to end up with a below-par total. But it was a different script for KKR early on with a fit-again Lynn giving them a flying start en route to his second fifty this season that came off just 36 balls. Having missed his team’s last match because of flu, Lynn went ballistic against Deepak Chahar who bled 22 runs from his first two overs with the Aussie smashing the seamer for 4-6-4 in the third over. Such was Lynn’s dominance that the otherwise explosive Sunil Narine looked like a spectator at the other end with the Aussie having a share of 31 off 33 runs in the first four overs. A 200-plus total looked imminent with Lynn looking dangerous and Russell starting to explode with a boundary and a six off Tahir.